Xact Contour All Weather Floor Liners by Husky Liners have the best fit around. 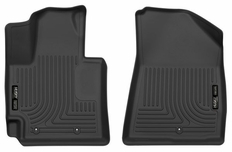 Xact Contour floor mats are engineered to fit the complex contours of your vehicle's carpeted floor boards exactly. Husky X-act Contour Floor Liners feature also feature raised containment walls that will help keep your carpet clean even in the worst weather conditions or spills. The Integrated fluid containment channels keep messes away from your shoes. This unique design keeps mud, snow, water and debris off your vehicle's expensive, hard to clean carpet. Integrated nibs on the back of the mats and the form fit design keep the mats from shifting. X-act Contour All Weather Floor Liners by Husky are made in the USA and come with a lifetime warranty against cracking or breaking down. The part number for this pair of front floor liners is 52321 and they fit 2014-2018 Kia Soul models.